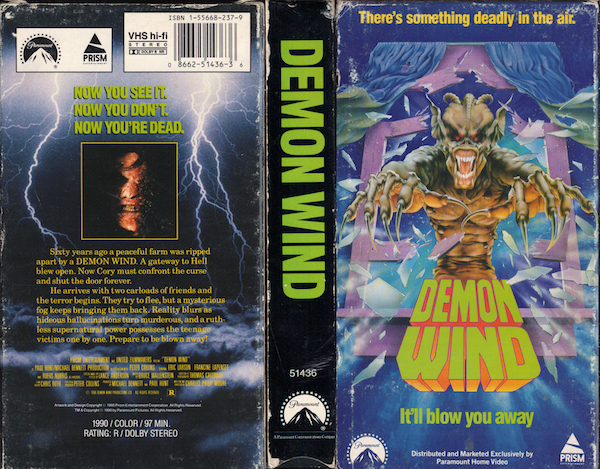 This entry was posted in Feature and tagged bad horror movies, cheesy horror movies, demon wind, demon wind 1990, demon wind horror movie, demon wind lenticular cover, dirty horror, feature, lenticular cover VHS, magician scene demon wind, movies I wanted to rent, movies I wanted to rent but didn't, rare horror vhs covers, rental regrets by Dirty Horror. Bookmark the permalink. I rented this in 1992. I remember the beginning some old man puking milk and saying “NOW MY PIG YOU DIIIIIIEEEEE” to his wife, never forget…forgive, but never forget..